We like to celebrate the awesomeness of our RunPals. So for 2019 we’ve started a new RunPal of the month. It could be an amazing achievement. It can be an exceptional support role. It can be literally anything that we at RunPals HQ agree deserves some serious recognition! Milene got her mojo back and started to really enjoy her running again. Her spirit is second to none and her post just this morning sums up the reason why just perfectly “This is the happiest day of my life” as she shared beautiful sunny pictures, running along our wonderfabulous playground of the south coast. Milene spreads cheer and happiness to everyone that she comes into contact with. She is pure joy to run with – it doesn’t matter what pace you are doing – she will always cheer you on. Milene, congratulations pal, we couldn’t have thought of a more deserved winner for the month of March. Kat shows true RunPals spirit in everyting she gets involved in. Whether volunteering, cheering, or just giving things a go. But for February, we were so impressed that Kat got stuck in to the Slindon Slog 2019, which was billed as an incredibly muddy challenging run. But, she did it. And certainly seemed to enjoy it, judging by this awesome picture. We’re stoked to have Kat as part of our wonderfabulous RunPals. 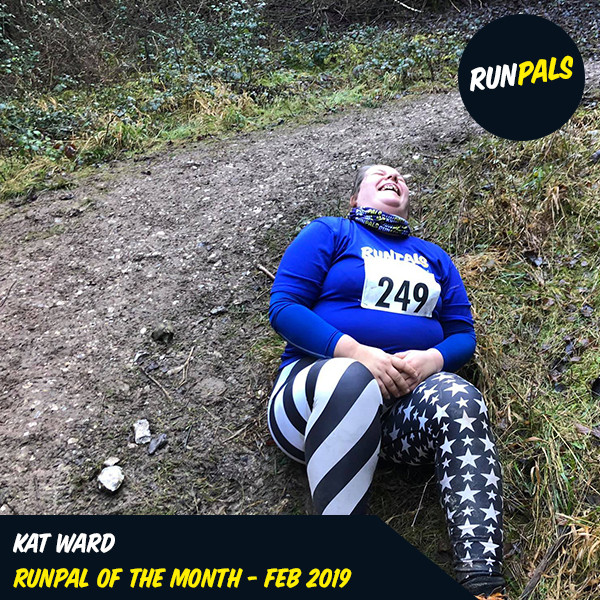 Congrats Kat on being our first RunPals of the Month!